When visitor hops from one domain to another the session connectivity is lost, in order to retain the session continuity line of tracking code have to be added to the site pages, in addition to the usual web analytics tracking code. 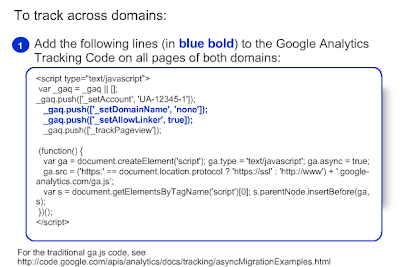 In this post I have compared the lines of code that need to be included in the master code of web analytics tools such as Coremetrics and Google analytics. Scenario: You send visitors from Site A to Site B in order to complete a purchase. Since GA uses first party cookies, wherein the same domain sets the cookies than a different domain, it is hard to find out if the same visitors has completed the purchase on Site B. This is simply because site A cannot set cookies for Site B, and the latter domain need to do it to get deemed as first party cookies. Solution: This is where _link () comes handy and enables the Site B to set the cookies, and the session gets continued for visitors moving from Site A to Site B without any turbulence, and tracking happens in a best possible way. Here is the necessary lines of tracking codes to keep the session moving from A to B. Scenario: Same as mentioned in the GA, you have to extend the sessions between two websites to track the path of visitors A and identify if visitor A has made a purchase / not in the second website. CM uses first-party cookies, and again the cookies have to be set by the same domain and not by any other websites. Solution: In Coremetrics cmSetupCookieMigration () does the trick in capturing the visitor activities from site A to site B (checkout-store.com). Note in both the tools: CM and GA, the codes need to be added in both the websites along with the client Id / Urchin account number. We all receive call from sales people at least once a day, and mostly we behave well without bursting out. But sometimes when we really need some kind of information / services, which could have been conveyed earlier by these people, we may not have it in our memory.. we regret.. and would wish for a follow-up call. Remarketing is a fantastic follow-up mechanism in the online world. Follow-up with your website visitors with offers, cross sell / up sell your products / services, communicate your free shipping and great discounts to your website visitors who added your products to shopping cart, but did not purchase anything. Consistently following up with the website visitors through huge GDN (Google Display Network) is a great opportunity to improve your customer base. 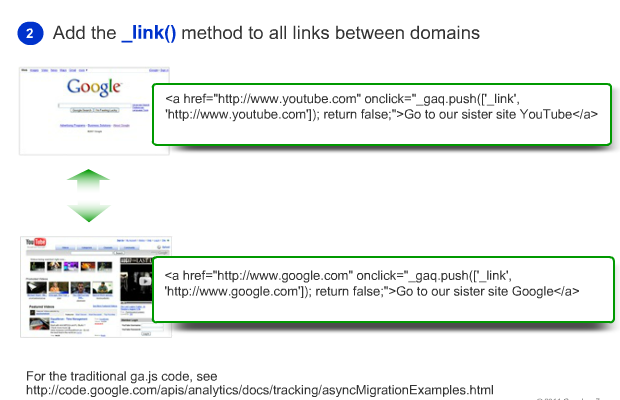 Link you Adwords account to analytics account. You can use one of the 4 pre-defined remarketing lists, and specify in which of the Adwords account that list is available. Watch this video on "Remarketing with Google Analytics"
Here is a PDF on GA & Remarketing. Targeting the same keywords for different pages thereby reducing the visibility for all; except one, which the search engines might consider for that query. Having the same keywords in different Adgroups. Only one keyword gets a chance to show-up from one account, thereby creating a tug-of-war among the keywords. Crowdfunding Campaigns and websites have begun to raise! Access the white paper here! DoubleClick search vision is to help digital marketers to run their search campaigns in a better way, by being before their prospects, with their products and service offerings, at right time and right place. DoubleClick has begun the new year with a new look to its website. See it here. Data highlighter is a new tool to tell Google about the structured data on the pages, particularly relating to your company events / social events / any other events. Data highlighter is an alternative to structured data which allows you to tag the data fields without modifying the pages on the website. 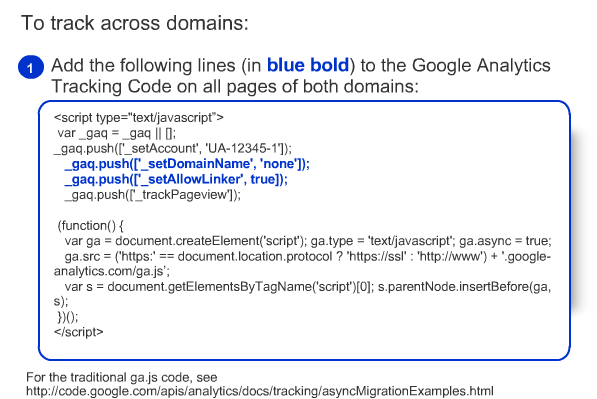 At this point of time you can use Google's data highlighter as an alternative to mark events of your page without implementing structured data on the page which requires codes to be implemented in the website. Using Data highlighter through webmaster tools allows you to highlight the type of events easily by making the right selections in your web page. You would be able to access the web page right inside the webmaster tools to complete your event highlighting work. You can then save the highlighted stuff, subsequent Google bot crawl will ensure you getting additional weightage in it esteemed search results. Tomorrow, Google could support other types of rich snippets also, facilitating you to do the tag any data fields of your website with a MOUSE and make your LIFE EASY.